You came to visit the new museum of contemporary art, the architect designed a building that looks like a stack of cubes in equilibrium. It’s beautiful. You enter, you take a ticket and begin the visit. Down to the first space, in the staircase, on the wall, this illuminating lighting. It faces you. It seems to be enlightened day and night, it exudes an aura of warmth. It suddenly comes alive, showing a first scene: a small group of young men wearing a T-shirt printed with the same words, arranged in the same way. They carry whistles, they lie down on the boulevard and suddenly stand still in a death silence. A few minutes later, they get up and walk in front a large and luxurious building, the headquarters of a pharmaceutical company, and when a car leaves a man in a dark gray suit, they point him out, and proudly display the black and white panels they’ve crafted to expose the cynicism of the firm when it deals with sick people. Looking at the neon: a second scene appears. 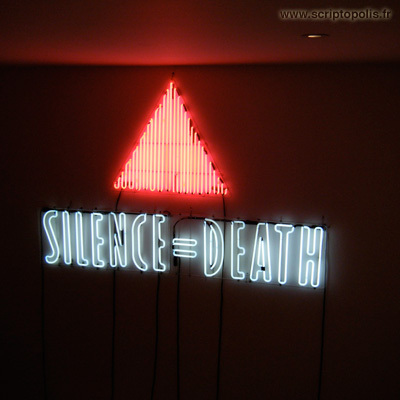 This time, « Silence = Death » was sewn onto a large rectangle of fabric, a patchwork. There is the name of a man, Gilles. Sewn to the first rectangle, so many other pieces with a name on each one: Pierre, Hervé, Michael… Men in white spread the large panel in a simple and beautiful ritual. This is December and it’s cold. This is our Day of the Dead. The pyramid contained a tomb.